The Great Wall of China is a UNESCO heritage site, and stretches 13,171 miles. It is probably the first thing tourists think about when they visit China. People know it is huge and that it protected a kingdom, but many do not know the history behind it and the details of its construction. If you do not have the chance to visit China and read information about the site, then this essay will supplement some of this missed knowledge. In the following paragraphs, I will breakdown the history of the Great Wall and hopefully you will gain insight into this important country and its ancient times. 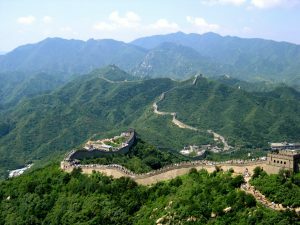 By 8th century BC, the Chinese were already building massive walls to fortify borders (Chiculture.net). In the Warring States period, the states of Qin, Wei, Zhao, Qi, Yan, and Zhongshan built walls to keep out attackers and to show where their borders were. These walls were commonly made out of earth, gravel, and wood (Newsmth.net). Out of the Warring States period emerged the victorious King Zheng of Qin, who had defeated his aggressors and vied to unify China. He was crowned the First Emperor of the Qin dynasty in 221 BC, and his initial order of business was to take down existing border walls in his empire that were meant to divide. After this was completed, he ordered that a new wall to be made along the empire’s northern edge, and to connect some walls so that the empire could be completely marked. However, he did not consider the walls to be a fixed construction: Zheng’s principle was to build and move forward with the empire. In this sense, the Qin Wall was more of a flexible and always changing fixture (Burbank, Jane; Cooper, Frederick). As you can imagine, the Qin Wall was difficult to construct without modern equipment. They did their best to use local materials from mountains and the earth. Sadly, today, there are only a few sections of the original Wall that still stand today. The exact length is not known due to a lack of records, and up to a million lives were lost as workers did their best to build this landmark (Slavicek, Louise Chipley). In the following periods of the Han dynasty (206 BC–220 AD), the Sui dynasty (581–618 AD), and northern dynasties (420–589 AD), the Great Wall was fixed, rebuilt, and expanded upon. Once again, the cost of lives was great, but they saw it as essential in order to keep northern invaders out of the empire. However, in the Tang (618–907 AD) and Song (960–1279 AD) dynasties, not much was done to defend against attacks in the north, and further work on the Great Wall was not put much attention to. As a side note, the Liao (907-1125 AD), Jin (1115-1234 AD), and Yuan (1271–1368 AD) dynasties built walls north of the Great Wall in Inner Mongolia and Mongolia (Waldron, Arthur). It was not until the Ming dynasty in the 14th century that the Great Wall truly flourished, though. When the Ming dynasty suffered a defeat by the Oirats at the Battle of Tumu, and the Ming could not push the Mongolian threat after many attacks, they decided to build a new part of the Great Wall in the north in the Ordos Desert (Karnow, Mooney et al.). The Ming also went for stronger construction materials, such as bricks and stone compared to mostly earth. In addition, there were about 25,000 watchtowers along this portion of the Wall in order to make sure the Mongols could not further their aggression in the empire (Szabó, József et al.). With some Mongolian attacks happening now and then, the Wall was continually being reinforced. Military general Qi Jiguang repaired and reinforced the north side of the Wall, and made an additional 1,200 watchtowers all the way from Shanhaiguan Pass to Changping (Great Wall of China). Though the Mongols were a major threat to the empire from its beginnings, in the Ming dynasty, the Manchu were also gaining ground. They are an ethnic minority of China, and they began to try to seize control of Ming power around 1600. With successive battles, the Manchu overcame the Great Wall in 1644 to conquer land with the help of Li Zicheng—a rebel leader against the Ming dynasty. But as the Manchus approached Beijing, the Ming dynasty made a truce with them, and both of the armies together easily dispatched Li Zicheng’s rebels. From this intense event, the Qing dynasty was formed (1636–1912 AD) and was the last imperial dynasty of China. With the power of the Manchu on their side and renewed unity, China’s borders soon went beyond the Great Wall and Mongolia was eventually annexed. When this occurred, the further construction of the Wall came to a halt (Elliott, Mark C.). The Great Wall’s construction started as a unification project from the Qin dynasty and ended with the last imperial dynasty of China, and with Mongolia finally under control. Perhaps millions of lives were given to its foundation, construction, and maintenance. Hundreds of battles and several wars were waged around and within its borders. The Wall stretches not only through land, but also through the many dynasties of the ever-developing China. 歷代王朝修長城 (in Chinese). Chiculture.net. Retrieved October 24, 2010. 古代长城 – 战争与和平的纽带 (in Chinese). Newsmth.net. Retrieved October 24, 2010. Burbank, Jane; Cooper, Frederick (2010). Empires in World History: Power and the Politics of Difference. Princeton, New Jersey: Princeton University Press. p. 45. Waldron, Arthur (1983). “The Problem of The Great Wall of China”. Harvard Journal of Asiatic Studies. Harvard-Yenching Institute. 43(2): 643–63. JSTOR 2719110. Szabó, József; Dávid, Lóránt; Loczy, Denes, eds. (2010). Anthropogenic Geomorphology: A Guide to Man-made Landforms. Springer.ISBN 978-90-481-3057-3. “Great Wall at Mutianyu”. Great Wall of China. Archived from the original on March 9, 2013. Elliott, Mark C. (2001). The Manchu Way: The Eight Banners and Ethnic Identity in Late Imperial China. Stanford University Press.ISBN 978-0-8047-4684-7.